Secretary-General Ban Ki-moon kicks off assembly: We have power to "wipe poverty from the face of the Earth"
But Rouhani, a moderate politician elected in June, has called for better engagement with the West, including in a Washington Post op-ed last week, in which he called for nations to work together on contentious issues such as Iran's nuclear program. Iran contends its nuclear program is for peaceful energy purposes; the United States and other Western nations accuse Iran of trying to develop a nuclear weapons program. So how will Obama respond to Rouhani's overtures this week? No meeting between the two presidents has been scheduled, as far as we know. But a senior U.S. administration official said Tuesday that the White House has "left the door open" to some kind of face-to-face interaction between the two, CNN's Jim Acosta reported. Could be a handshake. Could be more. Could be nothing. We'll see. Secretary of State John Kerry, however, will be meeting with Iranian counterpart, Foreign Minister Mohammad-Javad Zarif, at a Thursday meeting of the five permanent members of the U.N. Security Council, plus Germany. Discussions will surround restarting talks on Iran's nuclear program. we have a historic opportunity to resolve the nuclear issue. 5+1 needs to adjust its posture commensurate with the new Iranian approach. Regarding Obama's speech this morning, scheduled for around 10:10 a.m.: He will focus on U.S. policy toward the Middle East and North Africa, a White House official said, according to CNN's Jim Acosta. We're just moments away from Ban's opening speech. 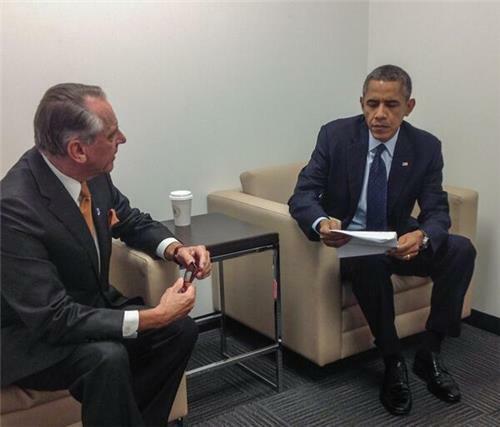 After Ban will be Brazil's Rousseff, and then Obama. Ban has kicked things off: "We come together not to preserve the status quo, but to drive our world forward." He's simultaneously giving a message of optimism and prodding -- he says our generation has the ability to "wipe poverty from the face of the Earth," but we're hindered by a number of problems, such as unresolved conflicts and youths without jobs. President Obama says the United States is "determined to prevent" Iran "from developing a nuclear weapon" but said diplomacy "must be tested." "We should be able to achieve a resolution that respects the rights of the Iranian people, while giving the world confidence that the Iranian program is peaceful. To succeed, conciliatory words will have to be matched by actions that are transparent and verifiable," he said. Talking about the Israeli-Palestinian issue, Obama underscored his support for Israel. "I have made clear that the United States will never compromise our commitment to Israel's security, nor our support for its existence as a Jewish state." The United States, he said, "remains committed to the belief that the Palestinian people have a right to live with security and dignity in their own sovereign state." Adding to what he said about the Israeli-Palestinian issue: "The occupation of the West Bank is tearing at the democratic fabric of the Jewish state." But Israelis have the right to live in a world that recognizes their right to live in security, he said: "The state of Israel is here to stay." 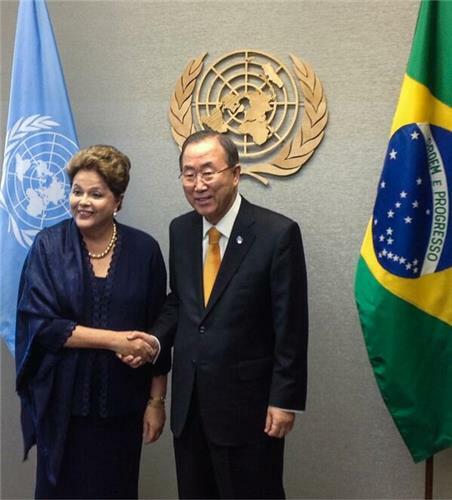 bit.ly/1b2bFDr #UNSG meets with #Brazil President @dilmabr on margins of #UNGA . Obama said "real breakthroughs" on Iran's nuclear program and Israeli-Palestinian peace "would have a profound and positive impact on the entire Middle East and North Africa." A quick look back in what he said about Iran: "We are encouraged," Obama said, "that President Rouhani received from the Iranian people a mandate to pursue a more moderate course. Given President Rouhani's stated commitment to reach an agreement, I am directing John Kerry to pursue this effort with the Iranian government, in close coordination with the European Union, the United Kingdom, France, Germany, Russia and China. "The roadblocks may prove to be too great, but I firmly believe the diplomatic path must be tested." Obama addressed Egypt, saying U.S. support for that country will depend upon that nation's "progress in pursuing a democratic path." "Our approach to Egypt reflects a larger point: the United States will at times work with governments that do not meet the highest international expectations, but who work with us on our core interests. But we will not stop asserting principles that are consistent with our ideals, whether that means opposing the use of violence as a means of suppressing dissent, or supporting the principles embodied in the Universal Declaration of Human Rights." Obama is now talking about Egypt, where longtime ruler Hosni Mubarak was ousted in 2011 and President Mohamed Morsy was ousted this summer. The United States' overriding interest regarding Egypt these past few years has been to encourage the existence an Egyptian government that legitimately reflects the will of the people, but respects minority rights and freedom of assembly, Obama said. Obama said it is important for the United States to remain engaged in North Africa and the Middle East. "I believe that such disengagement would be a mistake. I believe America must remain engaged for our own security," but also because "I believe the world is better for it," he said. Obama supported the action in Libya, where the U.N. Security Council "provided a mandate to protect civilians" and "America joint a coalition that took action." "Does anyone truly believe that the situation in Libya would be better if (former Libyan leader Moammar) Gadhafi had been allowed to kill, imprison, or brutalize his people into submission? It is far more likely that without international action, Libya would now be engulfed in civil war and bloodshed." Obama on #Iran : "conciliatory words must be matched by actions that are transparent and verifiable"
@MeetIran @HassanRouhani @JZarif when is last time so many Iranian officials stayed for US president speech? And that's it from Obama. Just a few highlights here: He said he was ready to use "all elements of U.S. power," including military force, to protect U.S. interests in the Middle East. He's encouraged that Iranian "President Rouhani received from the Iranian people a mandate to pursue a more moderate course," and he's directing his secretary of state to pursue a nuclear agreement with Iran. And he said that U.S. disengagement from the Middle East would create a vacuum of leadership, and that would be a mistake for the world. 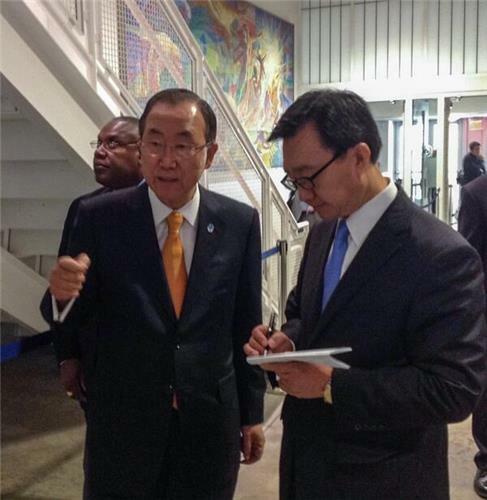 "We stand ready to do our part to prevent mass atrocities and protect basic human rights. But we cannot and should not bear that burden alone," he said. Next up: Turkish President Abdullah Gul. The issue of Syria is all-important to Turkey and Turkish President Abdullah Gul is expected to address the Syrian civil war. Gul addressed Syria's chemical weapons. "Turkey welcomes and firmly supports the US-Russian agreement to eliminate Syria's arsenal of chemical weapons, "but stressed that the "agreement has to be translated into a tangible UN Security Council resolution." "Once Syria comes clean about this arsenal, once and for all, it will be a relief for the Syrian people and the region." "I cannot emphasize this enough," Gul said: "Agreement on chemical weapons must not be allowed to substitute for a comprehensive political strategy to address the situation in Syria." 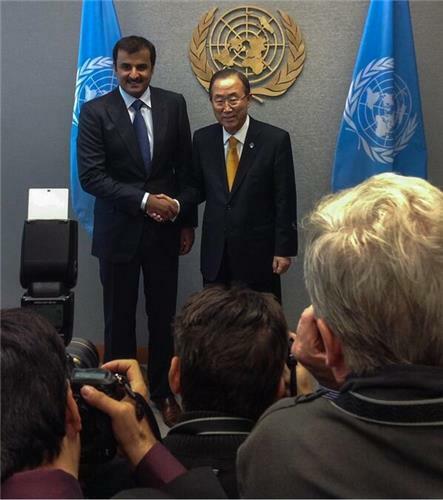 Turkish President Gul at UNGA:“we must realize that inaction by the security council only emboldens aggressive regimes." Speaking about the Palestinian issue, Gul said "the denial of the right of the Palestinians to have a state of their own has no justification on any moral, political, or legal grounds." We therefore welcome and strongly support the talks initiated between the parties under the auspices of the United States. The success of future efforts mainly depends on the Israeli government's acceptance of the establishment of a viable, contiguous Palestinian state." Abdullah Gul has finished his address. Nigerian President Goodluck Jonathan is next up. For the curious, the full list of today's 34 speakers can be found at http://gadebate.un.org/. New Iranian President Hassan Rouhani is among the speakers in the afternoon session. Nigeria has been a victim of terror by groups such as Boko Haram and its president, Goodluck Jonathan, warned U.N. General Assembly about the "threat of terrorism" and the need to fight terror. He also made reference to the attack by al Qaeda-linked Al-Shabaab at a Kenyan mall as an example of such activity. CNN's Reza Sayah, on CNN TV from Tehran, said people in Iran are optimistic after President Obama's speech to the U.N. General Assembly. Citizens, he said, are "hopeful" that U.S.-Iran relations can improve. Obama said in his speech: "We are encouraged that President Rouhani received from the Iranian people a mandate to pursue a more moderate course."